Butcher Block Oil is a natural protectant for all wood surfaces that come in contact with food. Use this oil-based finish on wood cutting boards, utensils, bowls and butcher blocks. The mineral oils used in General Finishes Butcher Block Oil meet all the requirements for use on wooden products that come in contact with food. Prep sand with 120-grit sandpaper. Remove food residue using a pastry scraper or spatula to gently scrape areas where you find dried-on food or residue. Avoid gouging the wood by keeping the blade at an angle that just skims the surface. Scrub using a scrub brush, Scotch Brite Pad, or sponge and scrub the butcher block with hot water and mild dish soap. Rinse with hot water: Run a clean dishcloth through hot water and rinse several times. Let the surface dry overnight before applying another coat of Butcher Block Oil. Apply 2 coats of Butcher Block oil with a soft cloth. Let the first coat soak in for half an hour and then wipe off the excess. Apply the second coat. Let it absorb into the raw wood for 5+ minutes, then wipe the surface completely dry with a clean cloth. 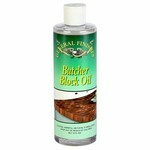 Food-safe Butcher Block Oil is a maintenance product. Regular applications are recommended to keep the surface stain-repellant and looking its best. Wipe up food and water spills immediately. Do not leave standing water or wet materials on a butcher block. Never let cutting boards sit in a sink. 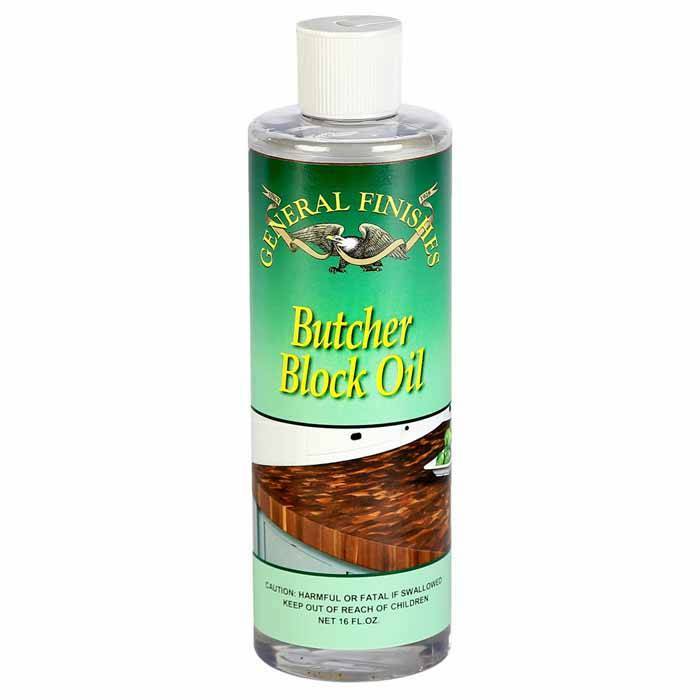 General Finishes food-safe Butcher Block Oil is a maintenance product. Regular applications are recommended to keep the surface stain-repellant and looking its best.